I present you the Trailing Stop that can do everything expected from a trailing stop. It can trail both real and virtual. 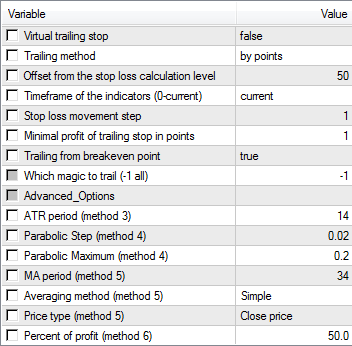 By points, as usual, by SAR, ATR and MA indicators, by candlesticks and by fractals. It can trail percent of the profit. It can do all of that based on the net breakeven as well as on each order separately. In the strategy tester the EA opens the order pairs by itself, so that its operation could be seen and understood. It is even possible to run optimization and develop a new strategy based on it. Check, test, and if you see something still missing, it will be added!